7.5 miles from Auburn Courthouse. Moderate-easy, many miles. This trail is useful for connecting to miles of trails upstream from the confluence without going to the confluence. 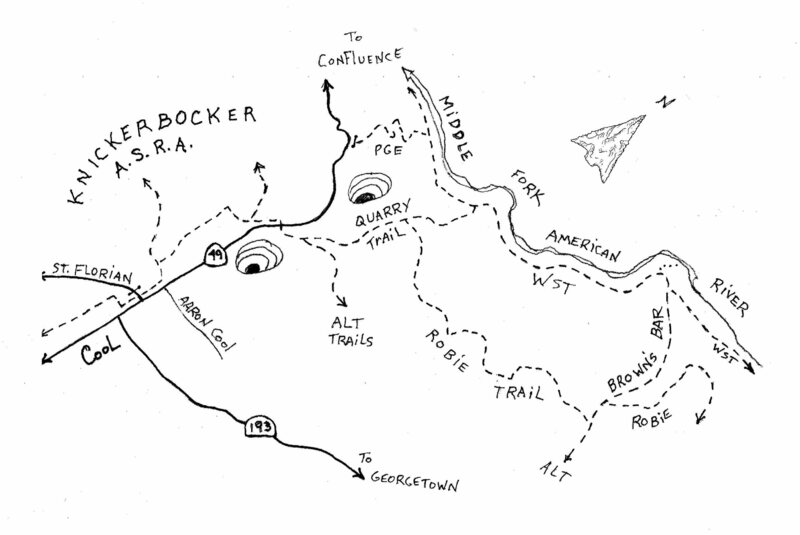 It begins near the town of Cool, cuts through part of Knickerbocker, goes around the Limestone Quarry, connects to the Wendell Robie Trail, and also connects to the Western States Trail which follows along the river. As if that weren’t enough it also connects to the Auburn Lake Trails too! (private connection from public land). Directions: From the Courthouse, take Lincoln Way (Highway 49) towards the town of Cool. Just before Cool turn L at Aaron Cool Drive and park here for free. (There is also a $10 parking lot behind Cool along Saint Florian Way if you’d like to help support our bankrupt California State Parks). The trail is across Highway 49 from here so be careful crossing this busy thoroughfare. Go right on the trail and follow it staying right at all of its junctions until you come to Highway 49 again after 1 mile. Again use caution to cross and go straight on the provided road thru the Quarry and out the back side where the trail turns to the left. Right away you come to an unmarked fork, stay left unless you want to go into the maze of amazing trails that infiltrate the gated Auburn Lake Trails Ranch lands. Staying left you switch-back down crossing a creek 3 times to reach another fork. Right connects you to the Robie Trail which follows mid-slope to Canyon Creek. This horse trail was funded by the Robie Foundation and it helps connect Auburn to the Dru Barner camp-ground on Bottle Hill road in Georgetown, 20 miles up canyon. Stay left and the trail will take you down to the river with one more mile of travel where you intercept the famous Western States Trail/Quarry Road.